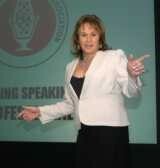 This week’s Author Spotlight is on International Keynote Speaker, Rikki Arundel. While only having 13 articles, the quality and consistency of her submissions quickly elevated her to Platinum Status with EzineArticles.com. Good use of keywords in her titles, pretty much spot on in regards to article content and length and her Resource Boxes are great too. Finally, Rikki went an extra-step by adding EzineArticles.com to her ma.gnolia.com bookmarks under her profile. Nice job Rikki!